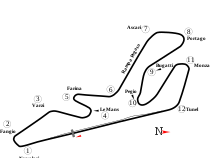 The Circuito del Jarama (Circuit of Jarama), formerly known as Circuito Permanente del Jarama (Permanent circuit of Jarama) is a motorsport racetrack located in San Sebastián de los Reyes, north of Madrid. It was home to the Spanish Grand Prix nine times between 1968 and 1981, and the Spanish motorcycle Grand Prix 15 times between 1969 and 1988. Designed by John Hugenholtz (who also created Suzuka), the 3.850 km (2.392 mi) circuit was built by Alessandro Rocci in 1967 on arid scrub land. It has a short main straight and most of the course consisted of tight, twisty corners so overtaking was extremely difficult. An example of this came when Gilles Villeneuve successfully defended his lead throughout the 1981 Spanish Grand Prix, despite a tail of four potentially faster cars. Villeneuve's turbocharged Ferrari 126CK, while powerful and fast on the straight, did not have as efficient ground effect aerodynamics as his pursuers - Jacques Laffite (V12 Ligier-Matra), John Watson (McLaren-Ford), Carlos Reutemann (Williams-Ford), and Elio de Angelis (Lotus-Ford) and was slower through the turns. This victory was to be the last one of Villeneuve's career. Jarama hosted its last Formula One race in 1981 when it was deemed too narrow for modern racing. It still holds sports car, touring car and motorcycle races. The circuit was lengthened in 1991, and then upgraded in 2015. In 1987, Jarama hosted Round 2 of the inaugural World Touring Car Championship for Group A cars, the 1987 Jarama 4 Hours. The race was won by Roberto Ravaglia and Emanuele Pirro driving a Schnitzer Motorsport BMW M3. Pole position for the race had been taken by triple Le Mans 24 Hour winner Klaus Ludwig in a Ford Sierra RS Cosworth turbo with a time of 1:31.434, while the fastest lap was by England's Andy Rouse (also in a Sierra Cosworth) with a time of 1:33.710. This page was last edited on 19 December 2018, at 06:32 (UTC).